Are you looking for a way to be part of the church’s history? We are offering a unique opportunity to buy a paver in the courtyard and have it engraved with your name or a special someone’s name. As part of Corpus Christi’s new church, the courtyard was designed to offer a unique opportunity to our parishioners and visitors alike. Pavers in the courtyard will be engraved with a name of the contributor’s choosing. The pavers come in two sizes and cost $100 and $50 with the donation made at time of your order. Funds will go towards the church building fund with the goal of paying off debt on our new church. 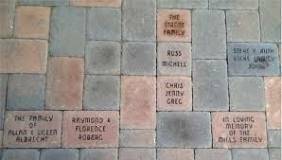 The paver project is a wonderful opportunity to honor the memory of a loved one by purchasing a paver in their name. Memorial pavers can make great gifts for those hard to buy for whether family members or friends. For more information, please call the church at (618) 632-7614. Checks should be made out to “Corpus Christi Church” and write "Paver" on the memo line.